The ranking was based on culture, friendliness, atmosphere, restaurants, lodging and shopping. The 10 cities under consideration were Kyoto and Tokyo in Japan, Hoi An in Vietnam, Ubub in Indonesia, Luang Prabang in Laos, Singapore, Chiang Mai and Bangkok in Thailand, Hong Kong in China and Siem Reap in Cambodia. Kyoto placed first. 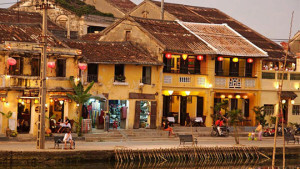 Hoi An, which was also in the top 10 last year, skyrocketed to the second position thanks to its “dynamic” atmosphere. Readers “fell in love with ‘the colorful houses and old mansions’, which ‘felt like walking in a movie'”, according to the survey. Another Conde Nast Traveler survey named the city’s hotel The Nam Hai the top resort in Asia. Other Vietnamese hotels were also represented in the magazine: the 112-year-old Sofitel Legend Metropole in Ha Noi placed fifth on the Top 25 Hotels in Southeast Asia list, which also included the Sofitel Plazas in Ha Noi and HCM City and Park Hyatt Saigon. This year, 79,268 readers cast 1.3 million votes for 16,000 properties nominated by Conde Nast Traveler. The survey was first launched in 1988.